Do You Need an Agile Marketing Certification? Agile marketing certification: a waste of time and money, or a crucial stepping stone on the path to true agility? This question is part of a larger, ongoing debate in the larger Agile community. So this Agile Marketing Minute video attempts to tame the certification circus, at least for marketers. Some members of the larger Agile community are very anti-certification. They believe that these courses stagnate the evolution of frameworks and practices by focusing on teaching only existing ways of working. The point of a certification workshop, they argue, is simply to pass on the current set of learning objectives. There’s no room for adaptation. On the other hand, some folks believe that certifications create shared understanding among a wide group of Agile practitioners. Without a grounding in core practices and principles, how are we to know what works for us? How can we have meaningful conversations if we don’t share a vocabulary? Of course, there’s no perfect answer to this debate. It’s up to each individual, team, and organization to decide what training works for them. Check out the video to see some ways to navigate the options available to Agile marketers in particular. As I’ve worked to establish and evolve our training practices at AgileSherpas, I’ve come to believe very strongly in the power of Agile marketing certifications. That is, when they’re chosen carefully and applied intelligently. This video offers some guidelines on choosing the right certification(s) for an Agile marketing effort (hint: you don’t all need to become Certified Scrum Masters). If you’re looking for opportunities to further your Agile marketing education, check out our list of upcoming workshops that include the Certified Professional in Agile Marketing certification via ICAgile. This group rigorously vets all courses and trainers, so you can be sure you’re getting an awesome educational experience along with a meaningful certification. Although not a certification-based course, our online Introduction to Agile Marketing offers a good jumping off point for your Agile education. Remember, consider your “why” carefully before forking over thousands of dollars for trainings. Many traditional workshops are software specific, and you’ll spend quite a bit of time translating what’s covered into marketing. If you’re OK with that, great. A few quick Google searches will unearth hundreds of courses. If not, seek out a marketing-specific course, and/or one geared more broadly towards business agility, like those listed above. But whatever you do, keep on learning! 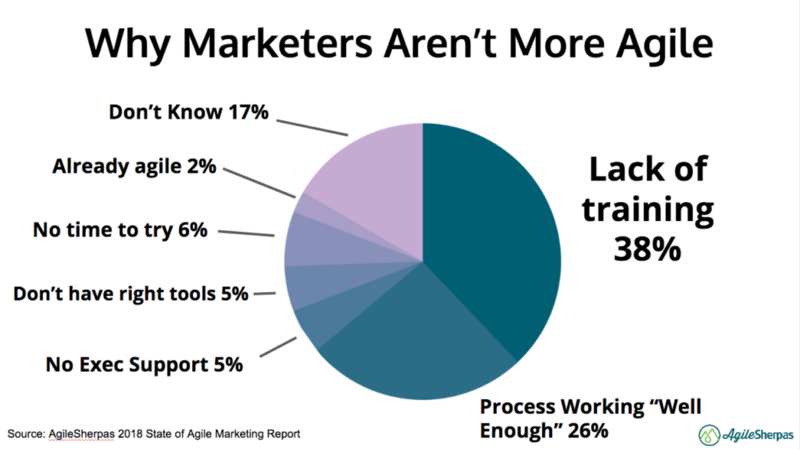 Remember, marketers cited a lack of Agile education as the primary barrier to agility in our 2018 State of Agile Marketing Report. Get over that hurdle with a well-designed training regimen. A formal Agile marketing education can help bridge this gap. The post Do You Need an Agile Marketing Certification? appeared first on AgileSherpas.